Any member can complete an application for an International Letter of Introduction by completing the on-line form in the On-Line Event Management System (OLEMS) at https://registrations.international.scouts.com.au. 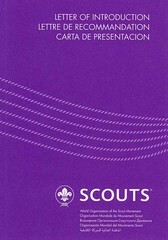 Note: A Letter of Introduction is only issued to members whenever they have plans to participate in or visit a Scouting program or activity whilst overseas. If your application does not provide detail of any planned Scouting involvement overseas, you are not eligible for a Letter of Introduction.